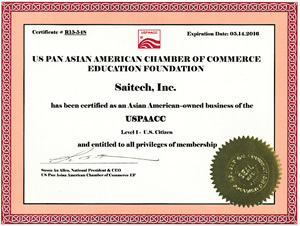 US Pan Asian American Chamber of Commerce - Saitech Inc.
Saitech is a certified MBE Supplier by the US Pan Asian American Chamber of Commerce. USPAACC is your gateway to innovative and cost-effective Asian American suppliers, information about Asian Americans and the robust Asia and Indian Subcontinent markets. In the next few decades, as minority groups become the majority in the United States, diversity is a strategic imperative. The core advantage of incorporating Asian American businesses into your supply chain would be to build good will, create a better understanding and appreciation of the economic value and long-term benefits that your corporation brings to the leaders and influences in the local and regional communities. USPAACC provides educational programs that are designed to assist corporations to leverage diversity in their global supply management chain. For example, at our Supplier Diversity Managers Summit, participants discuss issues and challenges they face, lessons they have learned, and ways to successfully organize and manage diversity initiatives to increase their bottom line. At USPAACC we go beyond doing what works, we help our corporations develop unique talent and global cultural competence; we invest in the next generation of innovators, accelerate corporate supplier success, increase market expansion and raise shareholder value.